Brazil commands the world’s attention now that the FIFA World Cup is finally underway, an event that is one of the most watched sporting events in the world. ESPN had record ratings during the inaugural game yesterday evening between Brazil and Croatia, which was held at Corinthians Stadium here in São Paulo. Brazil defeated Croatia, 3 to 1. As is obvious through the news stories covering the World Cup, this event has been intensely controversial here in Brazil. Various groups have levied protests and demonstrations, especially here in São Paulo. Generally, the complaints have been that Brazil has spent lots of public money to host the FIFA World Cup and, at the same time, has failed to invest adequately in the country’s infrastructure, education, health care and other services provided by the government. The World Cup construction projects themselves have been controversial, seen as corrupt boondoggles, especially the stadium in the city of Manaus. Other projects were not completed on time. I have been in Brazil since February, arriving in time for Carnaval in Florianopolis and then traveling around Southern Brazil for a month, visiting Curitiba, Iguaçu Falls, Gramado, Cânion Itaimbezinho and Porto Alegre before moving on to São Paulo where I have been living since late March, trying to learn Portuguese and as much as I can about the history and culture of Brazil with plans to remain here until August. Over this time, Brazilians commonly ask me why I would decide to spend six months of my life in this crazy country. Just about every Brazilian I have spoken with since I have been here is unhappy with the way things are going in Brazil. They think the global attention of the World Cup will expose Brazil’s flaws to the world at large, leaving a negative impression, and do not believe things will get better, even if there is a change of government come elections later this year. To the gringo tourist and to me, gringo but something other than simply a tourist, Brazil is a paradise… at least most of the time. However, I have the opportunity to leave whenever I want and I have been insulated from many of the extremely negative things that people in this country deal with every day. I also receive only a taste of what it is truly like to live here. Brazil has an inordinate share of violent crime. So far, I haven’t experienced this firsthand and hope and pray that I never will, but the specter of crime is everywhere in Brazil. Houses sit behind high walls and electric or razor wire. You constantly need to be on your guard especially in crowds but more especially when the streets are deserted at night. São Paulo is not a place where you can go jogging at 3 o’clock in the morning and feel safe. Military police are stationed at various points around the city. They provide an impression of security, but also an impression that this is a country constantly at war with itself. Much of this crime is fueled by the shattering poverty in which most Brazilians live. Brazil has extremely high and complicated taxes. It takes a company on average 2,600 to do their taxes, making Brazil one of the most time consuming places in the world for a business to do its taxes. Not working or owning a business here, I don’t worry about this sort of thing too much, but it affects me in that I try not to buy anything here if I can help it. Electronics, clothes, and other goods are sometimes outrageously expensive compared with their costs in the United States. Food is actually somewhat expensive as well. Here is a blog that gives you an idea what I pay for things here. If it is expensive to me, I can’t imagine what it must be like to live here in a low-wage salary trying to make it. Brazil is heavily bureaucratic society. Simply put, it is not easy to get things done here in Brazil. Luckily, I haven’t experienced this too much either. At times I have not been able to accomplish things because I do not have a CPF number (kind of like a Social Security Number) like buy bus tickets online, open a bank account, or use the free WiFi somewhere. One example of extraordinary bureaucracy occurred when I tried to pay for my Portuguese class by wiring money. After submitting the wire, the woman whose company I am taking classes with told me that her company’s bank was requiring her to present seventeen different forms of documentation and they were going to charge her an amount that was half of the cost of the amount I had wired over. I ended up reserving the wire and withdrawing cash over a number of days instead. Bureaucracy is an entrenched concept in government and other things here. Some say that it leads to corruption as people look for ways to get around the endless Kafkaesque regulations. Brazilians even have a name for this: jeitinho, finding a “little way” around the rules. I have witnessed jeitinho practiced a few times in minor situations, but wouldn’t recommend trying to attempt this sort of thing as a foreigner. Yesterday, both my Mom and a good friend of mine asked me if I was okay because they saw violent protests in São Paulo against the World Cup on the news. These protests have been going on for over a year and have built up over the last month especially. It is really only because the World Cup is here now that the American news media have decided to pay attention to what is going on in Brazil. Even with these protests, I haven’t been affected too much. The bus and Metro strikes were pretty annoying though, snarling traffic all over the city and making it difficult to get around. During the Metro strike, at least some of the stations remained open, so I was able to get from here to here without too many problems. One of the Metro stations I change trains in every day was the scene of one violent crackdown by the Military Police last week. Luckily, I delayed my Portuguese class that day. I had considered leaving Brazil during the World Cup, mostly for fear that I wouldn’t be able to find affordable accommodation, but the idea that I should leave because the country is going to be a big old mess has been telegraphed to me a number of times. “Imagina na Copa” was a familiar refrain anytime some problem was identified, suggesting that the problem would be magnified ten times over during the World Cup. I have been told that the celebrations for the World Cup this year have been somewhat tepid. Some people were probably hesitant to be seen embracing an event that is the cause of much criticism and angst here in Brazil. However, as predicted by some, this lukewarm anticipation is has been quickly heating up into a feverish excitement, as Brazilians cheer on their national team and adorn the country in displays of green, yellow and a splash of blue. 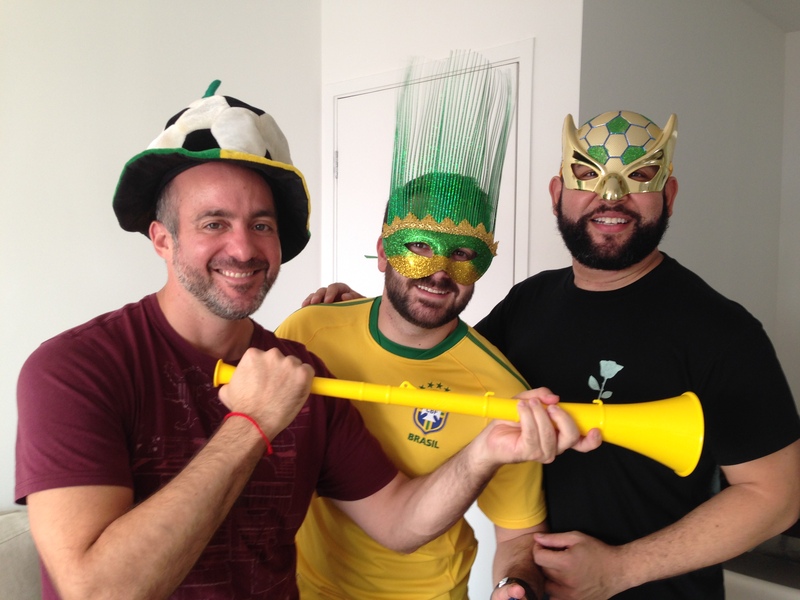 I watched the Brazil/Croatia game with friends in Morumbi last night. I took five different trains to get there and it was fun seeing all of the revelers, mostly dressed in yellow, headed either headed to Corinthians Stadium, the FIFA Fan Fest at Anhangabau, bars or barbecues at people’s homes. Watching the game with Brazilians was a lot of fun. I’m not a huge sports fan, but soccer (football) is a really easy game to follow and the enthusiasm of Brazilians’ support for their team is contagious. Fireworks and vuvuzelas filled the night with every great play and sometimes for no reason at all. So will the World Cup provide a temporary distraction for Brazilians from the problems of their country? Probably so in the meantime, especially if the Brazil national team does well, as they are expected to. However, I think the mood of the country will definitely change if the team loses early on, although some people do not want Brazil to win because it will be seen as making the re-election of Dilma Rousseff more likely. Nevertheless, so far it is a fun and fascinating time to be here in Brazil. Are you in Brazil during the World Cup? What are your impressions of the mood of the country so far?